Just when we thought we’d met our extraterrestrial shoe quota for 2012, our friends down the street at Mutt Industries came to us with another exciting project for Nike. This time, we were asked to create a video showcasing what would be the most expensive sneaker of all-time: the new LeBron X. The initial concept dealt with the themes of time and pressure (two things we’re quite familiar with here at the Castle!). 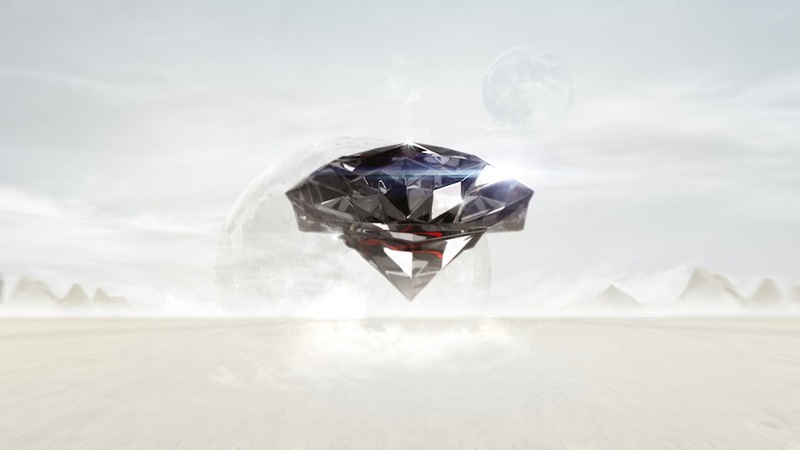 These elements would be represented on and within the reflective surfaces of an enormous black rock, a crystalline hunk of obsidian floating above a stark desert world. We came up with a number of different concepts for this imaginary levitating stone, some with good, salvageable ideas and some destined to never again see the light of day. A few early rock/diamond concepts. In the end, the decision was made to go with a multi-faceted rock that somewhat resembled an inverted geode and would thereafter be known simply as “the diamond.” And inside of this rotating and transforming diamond would reside the LeBron X sneaker, of which we would see only glimpses until finally, shirking its craggy prison, the shoe breaks free, much to the delight of footgear enthusiasts everywhere. Working with Mutt’s creative team, the tone of the piece—and the diamond in particular—grew darker and more disturbed as production went on. What was originally developed as a graceful, awe-inspiring gemstone gradually progressed into an aggressive, almost sinister artifact of alien origin, hurling shards of this mysterious metallic mineral and shuddering with repressed fury. Our tastes tend to lean toward the darker side, so we were all for taking the diamond a little further into the metaphorical (and physical) shadows. The finished product? Striking, otherworldly, and, yes, maybe a little bit creepy. That’s what we think, anyway. But don't take our word for it, go check it out here! CBC is working on it's first FEATURE FILM! More to come soon.